Another way we intend to save money on baby #2 is by using cloth diapers...we all know diaper prices can be ridiculous, and while the startup of cloth diapering is a little overwhelming, in the long run it can save thousands of dollars...well, worth it if you ask me! Besides that, since my un-potty trained almost 6 year old is actually in underwear, not diapers/pullups- we're already used to washing out poo and constant laundry (two big complaints I seem to hear most about cloth diapering). So, cloth diapering just seemed to make sense to me. After growing tired of buying wipes after wipes after wipes for my son, and finding that they just weren't getting the job done, I started looking into cloth wipes as well...and I am so glad I did! Not only has it already saved us money, but they seem to work much better on my hard to clean little man. Today I am going to share with you a very simple, very inexpensive way to make your own cloth wipes and wipe solution. Seriously, that's it! For our first set of cloth wipes, I purchased a cheap little blanket at the Dollar Tree...it made about 20 wipes, for just $1...not too horrible, but I knew I could do better. For our latest wipes, I went to our local thrift store and found some old receiving blankets...they regularly mark them $1 for two, but I buy when they have the 'color of the week' tag, making them half off- 25 cents per blanket. Each made about 16 wipes...much better price! You could also just buy a flannel fabric and do it that way, but I found this way to be cheaper and easier for us. After you have your blankets, all you have to do is cut them into little squares...see, how super easy is that? Of course you could get fancy and sew the edges so they look more uniform and pretty, I've even seen some who sew two sides together to make the wipes thicker...for us personally, these simple wipes work just fine. I don't have a sewing machine and the way I see it- they're just being used to wipe my child's tush anyway, so they just need to be functional, not pretty!! Of course, if you want to go an even easier route- baby wash clothes work well as wipes too. They cost a little more (we bought a 4-pack at the Dollar Tree), but no cutting required!! There are many great wipe recipes out there, using various essential oils, etc...just Google 'homemade cloth wipes solution' and you'll find a ton! I intend to experiment more in the future, but for now we use a very simple mix using ingredients most of us with little ones already have in the home. And you can really fit this solution into any budget depending on brands/products used! Add water first, then oil and finally soap to your spray bottle. When you are ready to use your wipe, simply spray onto the wipe. For particularly tough changes, I spray directly onto my son's tush as well. You can also soak the wipes in the solution (using a traditional wipes case or wipe warmer to store), but I've heard this can lead to mildew if not used quick enough, so we found for now this spray bottle method works perfectly! 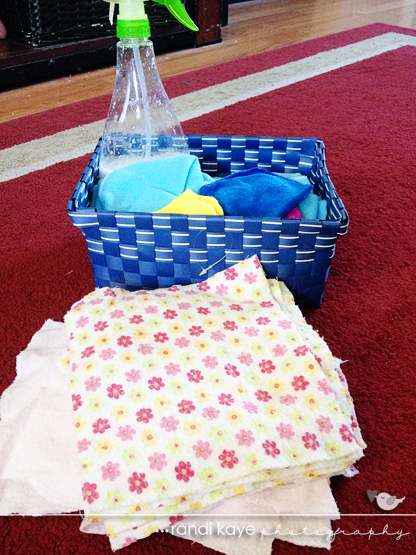 So there you have it- a super easy, super inexpensive way to make your own cloth wipes. I cannot believe how much money we wasted on store bought disposable wipes! So glad we finally made the switch! Do you use cloth wipes? Why or why not? Any go to wipe solution recipes you care to share? We love cloth wipes (and sell them in our Etsy store). Although I do recommend some sort of finishing on the edges because they can fray pretty badly. If you use t-shirts then you don't have to finish the edge because knit fabric doesn't fray. I look forward to seeing what cloth diapers you use! We've used several different types over the years (we have had 3 babies in cloth) and what they have available these days is amazing. I am enjoying the preparing for baby series. You are way braver than I. I cloth but I'm still using wipes! I have bought some baby wash cloths that were on sale as well as buying some off of etsy. =) I'll be cloth diapering my newest addition to our family come August. It will be our first time using cloth and I'm looking forward to it! Day Out With Thomas Is Coming To Indy!! Mommy, Will You Play With Me?